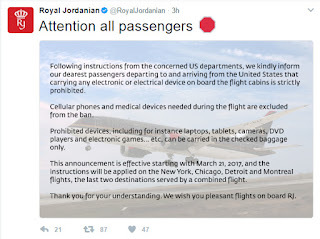 Royal Jordanian Airlines, the flag carrier airline of the Hashemite Kingdom of Jordan, announced that it would prohibit virtually all in-flight electronics for flights to and from North America starting March 21 then, without explanation, deleted all references to the ban. 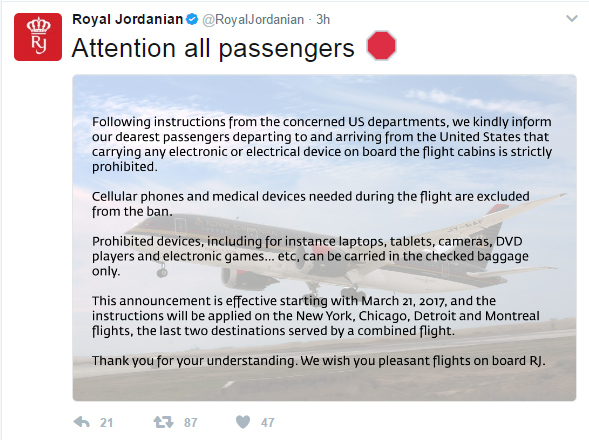 At approximately noon EDT on March 20, the Amman-headquartered carriers announced via its Twitter feed that laptops, tablets, DVD players and even cameras would have to be carried in checked luggage start March 21. The only exceptions are cell phones and necessary medical devices. Prohibited devices, including for instance laptops, tablets, cameras, DVD players and electronic games…etc, can be carried in the checked baggage only. 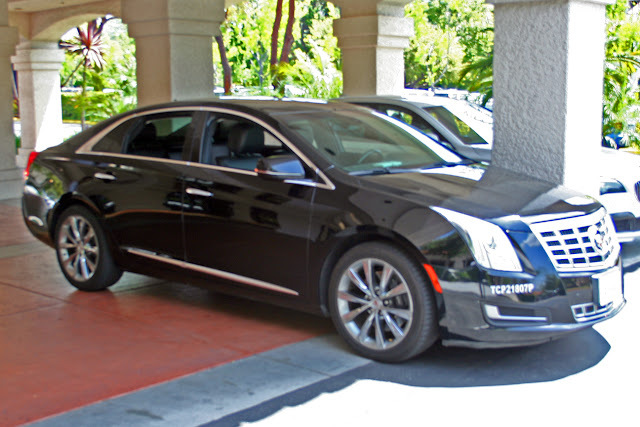 This announcement is effective starting with March 21, 2017, and the instructions will applied on the New York, Chicago, Detroit and Montreal flights, the last two destinations served by a combined flight. Thank you for your understanding. We wish you pleasant flights on board RJ. After requesting for more information about which "US departments" made the request and the basis of their concerns, TheTravelPro checked the airline's Twitter page at about 5 p.m. EDT to find that the original Tweet, captured above, "is unavailable." Further, there were no references to the ban on either the landing page of the airline's website, its Newsroom or on its news feed. Messages seeking additional detail and sent to the carrier's Twitter page as well as directly to the airline have not yet been unanswered. 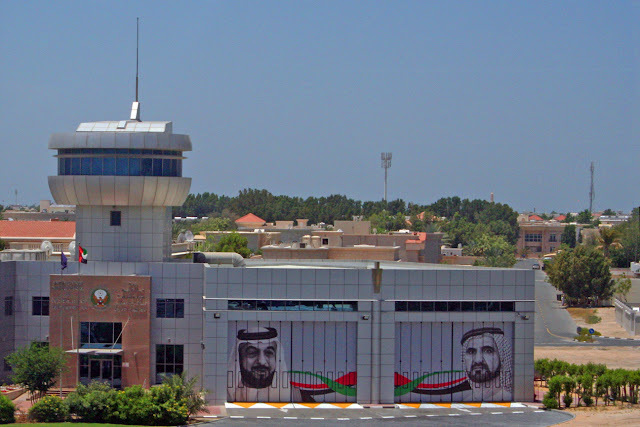 There are numerous plausible scenarios, ranging from the airline's social media team publishing a draft message that had not been formally approved to those unnamed "US departments" backing off on their request to the airline's leadership deciding that it would not accede to the anonymous "instructions" as well as other possibilities. 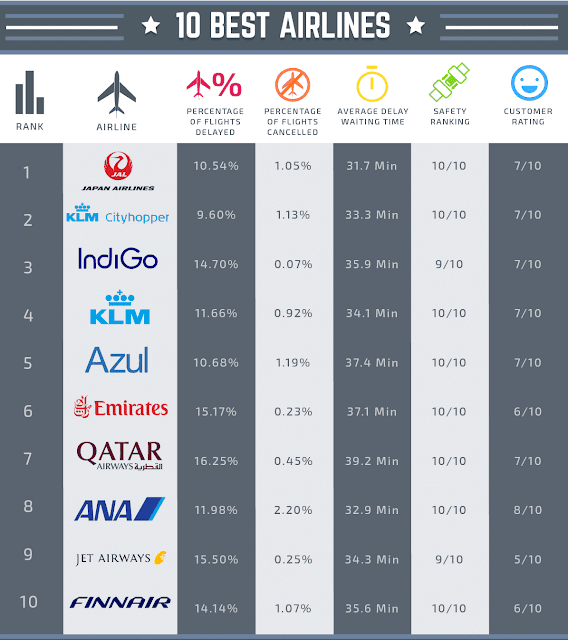 TheTravelPro will not speculate about the reason but will share whatever is learned in a subsequent article.